While Audi sells the high-performance S6 sedan in America, the Avant variant has been forbidden fruit and only available in Europe. Thankfully, this could change in the future, as Audi recently hinted it could finally be bringing some of its acclaimed performance wagons to the US such as the A6 and RS6 Avant. Our spy photographers recently caught the new RS4 Avant facelift undergoing testing, and now a prototype of the upcoming S6 Avant has been spotted for the first time. Slotting between the regular A4 and the range-topping RS4 Avant, the S4 Avant prototype can be seen being put through its paces on the roads of Sweden. Visually, the changes applied to the S4 Avant appear to be similar to the A4 and RS4 Avant prototypes, with sharper styling, redesigned headlights and taillights, and a newly designed 3D grille found on the flagship Q8. At the back, the rear bumper will also likely get a redesign. We can also see the new rear light graphic, along with Audi Sport’s signature quad exhaust pipes. No photos of the cabin have been provided, but the updated S4 Avant should get Audi’s latest infotainment system and a larger screen. 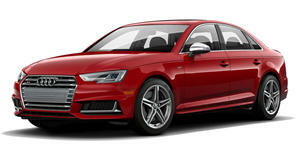 Power in the current S4 comes from a 3.0-liter turbocharged V6 engine that produces 354 horsepower and 369 pound-feet of torque, mated to an 8-speed automatic transmission and all-wheel drive as standard. The updated S4 should get the same powerplant, but it could get a slight power upgrade. The updated S6 Avant is expected to arrive either later this year or in early 2020 after the regular 2020 A4 debuts. Whether it goes on sale in the US remains to be seen, but we’re keeping our fingers crossed.